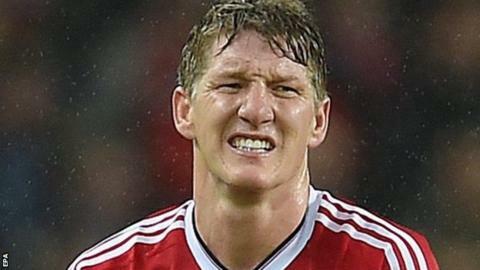 Manchester United manager Jose Mourinho should be sent to jail for "bullying" Bastian Schweinsteiger, claims a member of world players' union FifPro. The midfielder, 32, signed a three-year deal in 2015 and played 31 games last term but has trained alone and with the Under-23s since Mourinho took over. "It's clear bullying," Slovenia FifPro member Dejan Stefanovic told the BBC. "In Slovenia, we would have indicted Mourinho and asked for the highest penalty - three years in prison." Mourinho has yet to talk about Schweinsteiger's future but is due to hold a press conference on Friday to preview Sunday's Community Shield against Premier League champions Leicester City. BBC Sport has contacted United for comment but is yet to receive a reply. Speaking to BBC World Football, lawyer Stefanovic, who is also president of the Slovenian Footballers and Sportsmen Union, added: "This is clearly meant to discourage Bastian. "Mourinho is setting a bad example. I would take it to the ordinary court. In our case, the penal code is quite clear. If there is bullying and harassment, there's a prison sanction, a maximum of three years in prison. "All the players of the first team have to train with the coaches of the first team at the same place, at the same time as all other team-mates. "That's something that should be applied to each and every club and should be written within Fifa regulations." Schweinsteiger, who has made 120 appearances for Germany, joined United from Bayern Munich. He was left out of Mourinho's 25-man squad for last weekend's 5-2 friendly win over Galatasaray in Gothenburg and was not part of the 22 for Wayne Rooney's testimonial with Everton on Wednesday. Schweinsteiger's brother, Toby, who is assistant manager of Bayern Munich's Under-17s team, sent a tweet on the evening of the Galatasaray match which merely said: "No respect." Bayern Munich president Karl-Heinz Rummenigge, another former Germany captain, told German publication Bild: "One or two players are going to think long and hard in future about whether they want to go to such a club."